Feds Spending $20M On Security Detail For Betsy DeVos - Joe.My.God. That far exceeds the $3.5 million spent on security for former EPA Administrator Scott Pruitt, who resigned in July amid questions about lavish spending habits during his 17-month tenure at the agency. An EPA inspector general report, released Sept. 4, found the price tag for Pruitt’s security detail was “not justified” and far exceeded the security costs incurred under past EPA heads. 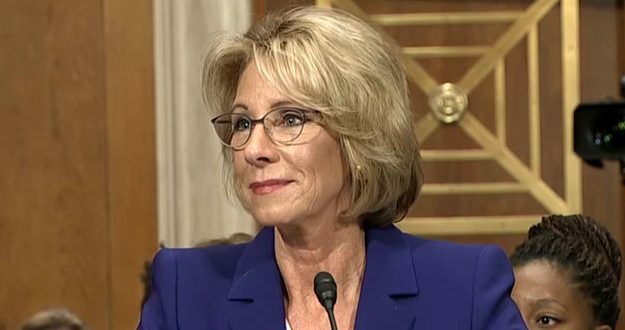 After receiving the Marshals’ protection, DeVos spent less than 4 percent of her time visiting traditional public schools in the school year that began in September 2017, according to a tabulation by NBC News and the Watchdog group American Oversight, which was founded by lawyers, including several from the Obama administration, who focus on government ethics and conflicts of interest.